This product requires the base game Sid Meier’s Civilization® IV Complete. 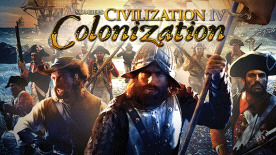 Classic Game Design Rebuilt for the Modern Era – Usher forth a new generation of Sid Meier's Colonization gameplay built on the award-winning Civilization IV engine, providing the beautiful visuals, famously addictive gameplay and endless fun that are synonymous with Sid Meier strategy games. Fight the Homeland and Establish a New Nation – Play as the English, Spanish, French or the Dutch and journey to a brave new world in search of freedom from your oppressive homeland. Improved Diplomacy – Sustain peace and support your followers as you engage in advanced negotiations with natives, other colonists and the hostile homeland - Trade resources, gold and land as you build the foundation for a self-sufficient and powerful colony. Historical Figures Provide Adaptive Gameplay – Acquire founding fathers such as John Smith,Patrick Henry and Samuel Adams who will help guide your nation to freedom based on your gameplay style. Brand New Interface – Both Civilization IV fans and players new to the series will feel right at home with an interface that Firaxis has built to be accessible and easy to navigate. © 2006-2012 Take-Two Interactive Software and its subsidiaries. All rights reserved. Sid Meier's Civilization IV, Civ, Civilization, 2K Games, the 2K Games logo, and Take-Two Interactive Software are all trademarks and/or registered trademarks of Take-Two Interactive Software, Inc. Developed by Firaxis Games. Firaxis is a registered trademark of Firaxis Games, Inc. Uses Bink Video. Copyright ©1997-2012 by RAD Game Tools, Inc. Uses Miles Sound System. Copyright ©1991-2012 by RAD Game Tools, Inc. Portions of this software are included under license: ©2005 Scaleform Corporation. All rights reserved. Civilization IV is required to play this DLC.